We initially detailled what developers were calling an iPhone 4S’ way back in April. It was essentially an iPhone 4 with an upgraded processor. Then an iPhone that was supposed to be running on T-Mobile USA’s 3G network turned up shortly thereafter with an interesting antenna design. 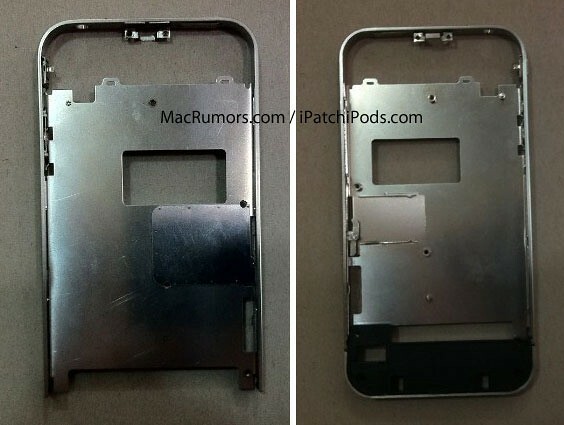 Today, iPatchiPods.com and MacRumors stumbled upon some of what they think might be ‘iPhone 4S’ bodies. Both sides of the frame are shown above and feature a slightly different antenna design than the iPhone 4 with the only breaks being at the bottom of the phone. Interestingly, the frame also deviates from the iPhone 4 in where the home button lies, leaving them to speculate that there might not be a home button, there could be a capacitative home button or some sort of other redesign.